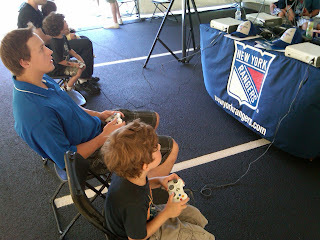 So The Dark Ranger and his Dark Juniors spent the day at the Rangers Fanfest in Tarrytown, NY at the New York Rangers training facility, a free to Season Ticket Holders (that use their Amex cards) event designed to get us excited for the upcoming season. Prior to our leaving, my 4-year old Dark Junior (pictured below) and I reviewed last year's team program to decide who'd we like to see at the FanFest. Ironically, most of those players he wanted to see were no longer on the team. In fact, there were only four or five players listed in the souvenir program that still remain on the team (with the exception of the unconfirmed 'Dubie Bran-Bran'). I know, I know...he'll be signed. I subsequently attempted to explain that he'd need a PhD to know, let alone pronounce, all the new players on our newly assembled Blueshirt squad, but perhaps his blank look was the result of being only four years old. 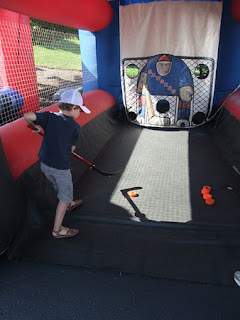 Once we arrived, I realized this was an event built around NYR fans with KIDS ONLY - basketball hoops (great for a hockey event), a merchandise shack, liability waiver forms, pickup street hockey rink with plastic hockey sticks, oversized number 9 for obvious Adam Graves pictures later in the day, and plenty of hamburgers, hot dogs, chicken sandwiches and free sponsored drinks galore! So with kids, I was in luck. Arriving sharply at 10am, we slowly worked our way into the event and took advantage of everything they had to offer. What was a bit surprising were the number of grown-ups without kids, die-hard fans getting face painted!!? Most of them wearing jerseys, many fans wearing jerseys with their own names on the back (bad, bad form and just not right - though, I could be wrong if anyone's ever heard of 'Rubenstein' as a Ranger). 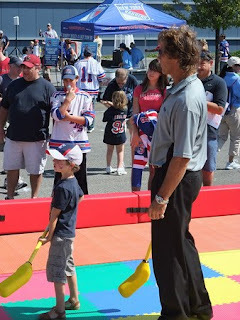 It was an expected party-planner party with mounds of food, prizes for all and a fan-forum tent where you were treated to Sam Rosen from MSG interviewing the regulars: Adam Graves, Ron Duguay, and a very different looking Nick Fotiu (than the much younger headshot he was signing for fans). It was full of the usual questions (SAM: "So what we're missing is a big Center this season....how do you think the Rangers will compensate for this missing piece. Is Dubi ready for the job?" This question was answered by all alumni at the forum with the expected answers on believing in the new Coach Torts system and believing in our youth, yada, yada, yada). I am one jaded Rangers fan, obviously, as most in the tent seemed to be hearing this garbage for the first time. Apparently, Mark Messier later showed up for Sam's avant-garde questioning and quickly disappeared before he was savagely assaulted by overstuffed, face-painted jersey wearing adults without kids. And then there was free food...tons of it -- the least MSG could do for those of us loyal enough to stick around during the 21st Century Depression. My family ate the equivalent of $455 worth of food at The Garden. So thank you Mr. Dolan. We appreciate the give-back. 3. Or Father of a Kid. As a season ticket holder for almost ten years, I thought the timing was right for this to happen pre-season and I actually commend all of the Garden employees that worked a Saturday to be interested in 'the everyday season ticket holder' - to ask what section I sit in, and how long I've been there...and mostly to thank me for continuing to support the franchise. I was proud as Father DARK and I was proud of the organization (for once). 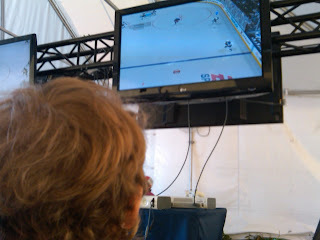 Mostly, this event with my kids reminded me how proud I am to be a Rangers Fan. Thanks guys! Dark Junior & Ron Duguay doing an impression of Michal Rozsival & Wade Redden. 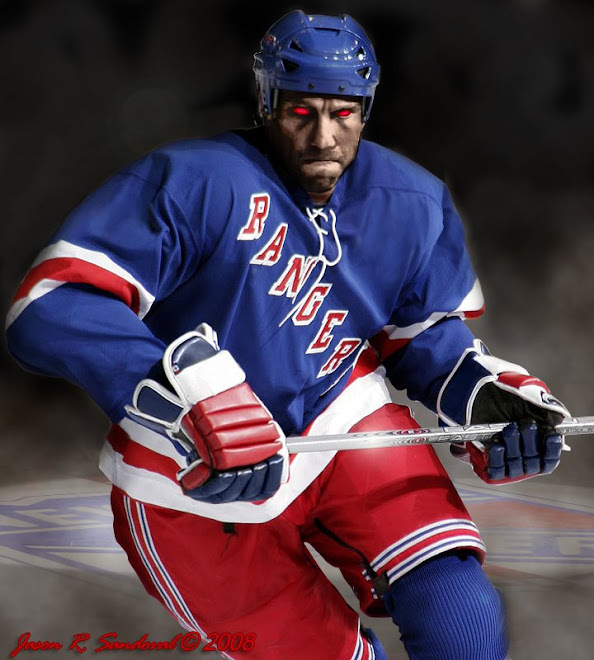 Tyler actually programmed himself on the Rangers' first line. Dark Junior stole the puck from him a number of times, which in itself, is not a good sign of Tyler actually making the cut this season. Hello Hartford! Dark Junior actually said, "Take That Marty! 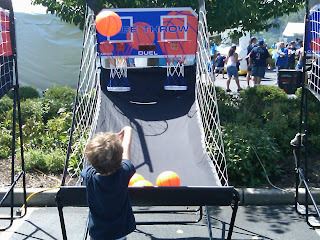 on this shot"
That's awesome that you and Jr. had a great time. And it is incredible that he kept stripping Arnason. Maybe we should add a "Dark Jr. Hockey dreams Collection" to the sidebar. Home grown Talent and hes already better than Arnason at age 4!!! j...Torts did say he was pointing to the youth...not a terrible idea.